Hey Girlfriends! Kris here! This post is part of a series of our weekly “Fri-yay Weekly Demo” series! Our lucky local customers love our weekly in-store demos. Every week we have a new demo at our demo table! I am going to be sharing these demos on our blog, along with releasing the products for those demos every Friday! Now you don’t have to be local to enjoy our in-store demos! 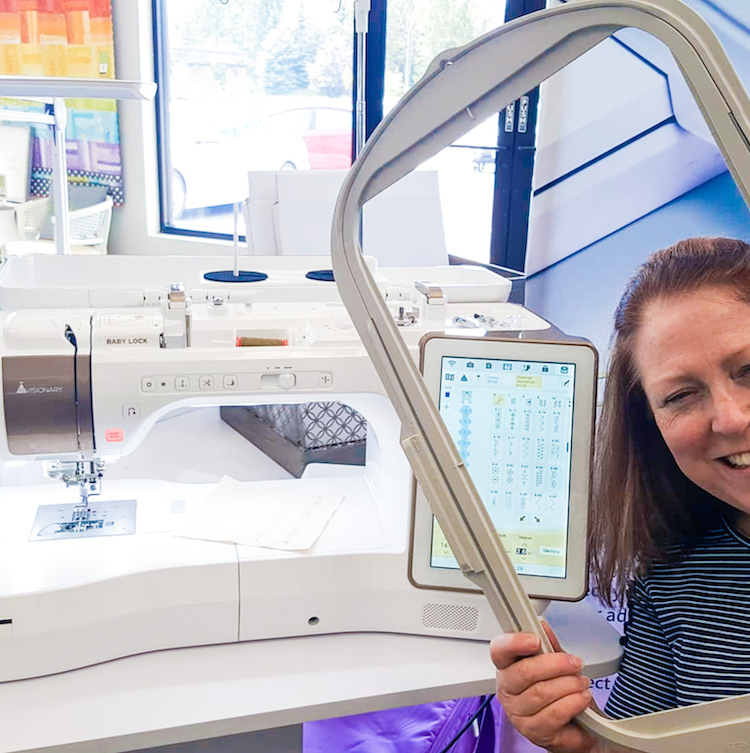 Read about last week’s demo about making your own Disappearing 9-Patch Throw Quilt here! All About the NEW Baby Lock Solaris: Fri-yay Weekly Demo! I left for Baby Lock Tech with that mindset; in fact, the majority of the team that came with me thought the very same thing! As soon as I got to sit at this machine and learn all that it could do, my tune changed immediately, and I think your’s will too! I am officially IN LOVE with this innovative, top of the line machine! 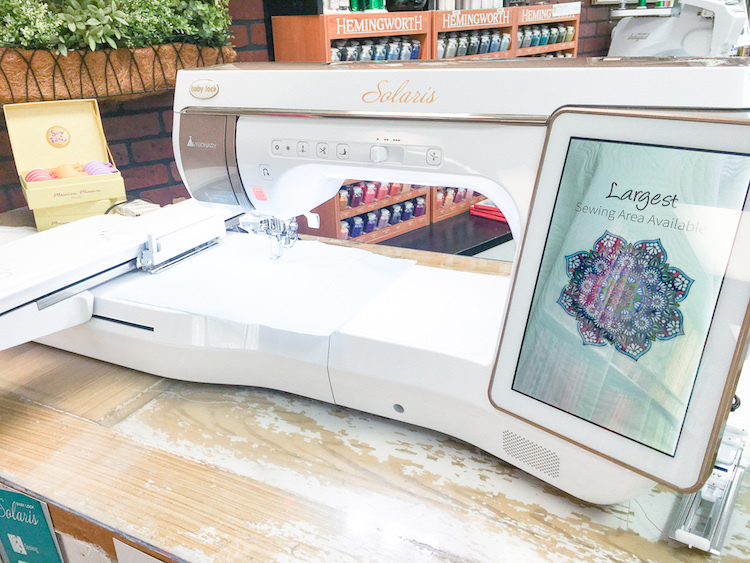 This machine does everything that you didn’t know you were missing with your other embroidery machines! I felt like I couldn’t capture my love for this machine in the written word, so have made a series of three videos to watch, demonstrating some of my all time favorite features on the new Solaris. The number one question I get about the new Solaris is how does it compare to the Destiny. All I can say is… Destiny owners, you might want to consider trading in your Destiny! And that is a BIG deal coming from me, because I am still a HUGE FAN of the Baby Lock Destiny! In this video I am pointing out my FAVORITE feature on the Baby Lock Solaris, and that is the IQ Visionary Projector! This will completely revolutionize and change the way you line up your projects! No more mishaps when you have to re-hoop during a project! You will have absolute control and precision during every single project! And for the final video, I am showing you how easily you can achieve perfect placement on the new Baby Lock Solaris! This week we are having a fun photo contest to celebrate the new Baby Lock Solaris! 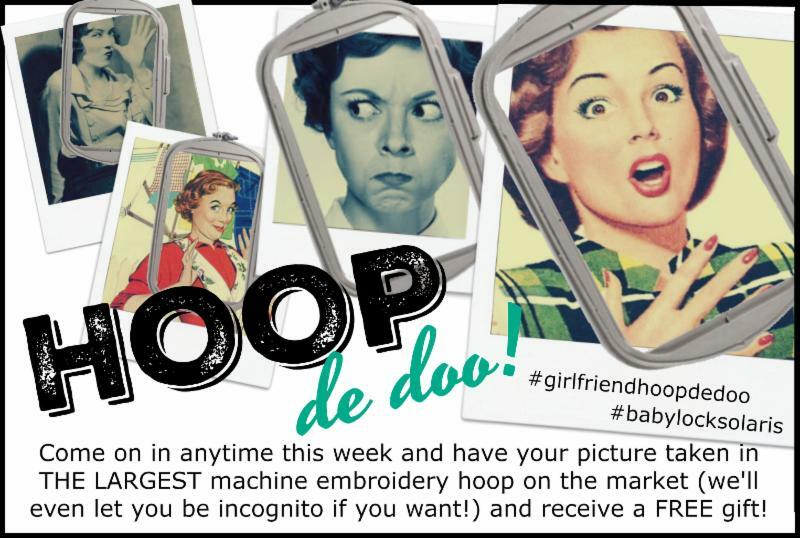 If you post your photo online with the hashtags #girlfriendhoopdedoo and #babylocksolaris you will be entered into a drawing to win a $100 gift basket from Kimberbell Designs! Come in anytime to any of our locations to take the new Baby Lock Solaris for a test drive! Thanks for watching, girlfriends!